At the time, Hasselbeck called it a thrill and said it was a win-win, this opportunity to meet the president and get out of a team meeting. ...But Washington is a blue state, and deep, deep Democratic blue in King County. So objections were raised, and Hasselbeck heard them and read them. He got nasty voice mails, e-mails and text messages. "I had no idea," Hasselbeck said. One guy told him: "I hate you, I'll never wear your jersey, I'll never like the Seahawks again." "Politics can be very mean and dirty," he said. "The things politicians say about each other, and what activists say, I had a brief glimpse of that for a couple of days. "If I ever had any questions about whether I wanted to run for office, I now know the answer -- I don't." As a quarterback, he's used to getting booed. "But this was a whole new level," he said. "I was very surprised how mean (they were)." 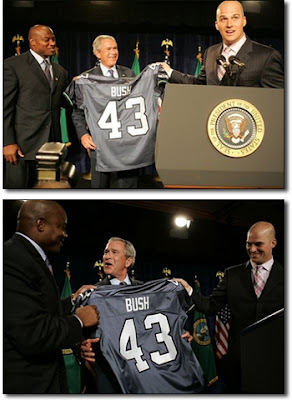 ..."To learn that two of the most popular Seahawks are strong (Bush) supporters ruins the season for me and my family," wrote another. ...When told that Hasselbeck lost some fans, Holmgren said: "That's too bad. ... Fans should keep these two things separate." Added Hasselbeck: "I don't understand. This is America. We're not going to agree on everything." Strong doesn't get it either, saying: "Any time you have a world leader come to your city, you should welcome him whether you like the person or not. That was the right thing to do." Besides, Strong wonders, "Why would people care about what we do as far as going to see the president and giving him a Seahawks jersey?" Strong and Hasselbeck said they would have welcomed a Democratic president, too, and noted that they once visited Gov. Christine Gregoire in Olympia and gave her an autographed football. When he played in Green Bay, Hasselbeck also met former Vice President Al Gore. You couldn't have been much of a fan to begin with if THIS makes you hate the team and ruins the season for you.